popular as an alternative to the traditional practice of disposal of effluents by discharging to surface waters. The Rapid Infiltration Basins (RIBs) and Rapid Infiltration & Extraction (RIX) offers the possibility of cost-effective tertiary treatment through percolation of the reclaimed water within the biologically and chemically active soil environment. The operation of RIB and RIX projects in the United States and elsewhere has demonstrated the ability of the soil environment to reduce nutrient loads in reclaimed water. 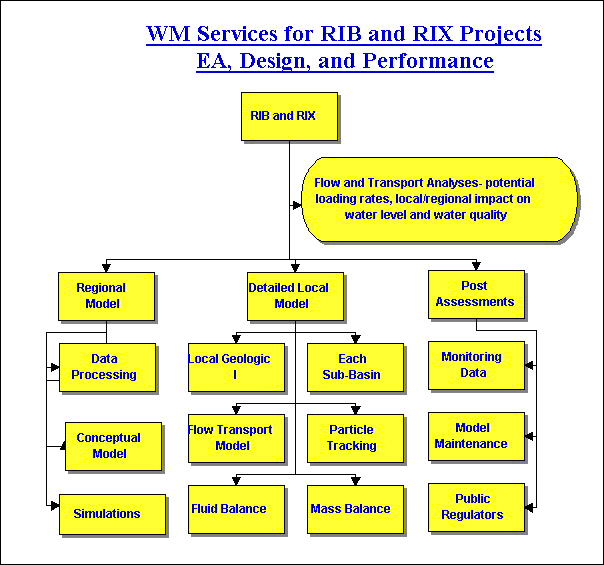 EWM has developed systematic approach for providing viable support and state-of-the-art technologies for following services related to RIB and RIX projects. Reliable groundwater quantity and quality assessments need regional and site specific data. internet base data distributions “too much data” is becoming common (at least for the regional data). EWM has developed efficient cost and time efficient procedures and tools to compile available data in data repository of the project and their uses. EWM concise informative displays explicitly define available data at each well and historical trends. 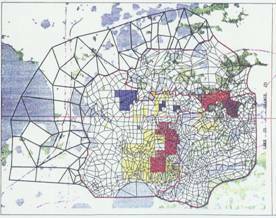 EWM technologies provide efficient means for mathematical modeling of local site within regional model. “Real world” complex geometry of external boundaries, rock outcrop, and variations of grid (horizontally and vertically) are efficiently represented for relatively accurate simulations. Environmental and groundwater project implementations costmillions of dollars over the project life. During past three decades EWM developers have been incorporating efficient capabilities for wide range of field needs. EWM strongly believes in designing and assessments of “real world” problems with appropriate representation of physical shapes as conceptualized. Each RIX and RIB site has to demonstrate regulatory compliance. 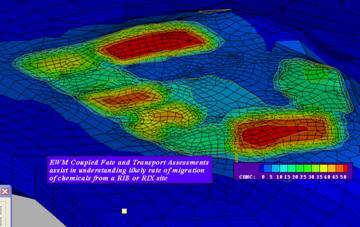 EWM 3D particle tracking algorithms provide needed understanding of likely flow directions and travel time. Since RIB and RIX projects are recharge sites, groundwater mound created at the RIB and RIX sites causes divergence of regional from up-gradient flow and do not “pull” the regional contaminants (if any present) in to the site. However down-gradient flow may cause accelerated movements. EWM fate and transport model results assist in quantitative understanding on contaminant migration. 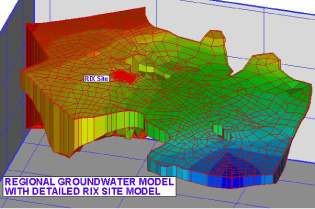 Permit applications and performance assessments require detailed fluid and mass balances by each basins adjoining to RIX and RIB sites. 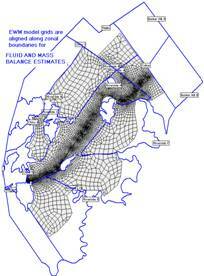 EWM interactively generated grid aligns model element sides along the required basin boundaries for relatively accurate estimation of fluid and mass balances in each basin. EWM groundwater codes generates informative tables of waterand mass balances along with totals of in and out flows between two adjacent basin boundaries. One of the key requirements in this assessment included quantitative estimates of likely contribution to surface water bodies. 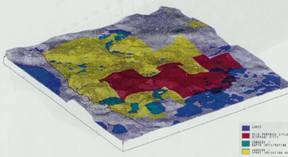 EWM groundwater capabilities for aligning element sides along the RIB site boundaries and surface topography details were imported in the input files. EWM post processing tools generates fluid and mass balances for keeping regulators and public informed.